So last year I got a pass for Colchuck for August but it was right in the middle of the fire season and due to asthma had to back out. It is still on my bucket list. This year fearing more fires and not wanting a repeat I was lucky enough to finally get a core permit (4 years trying) but for July 9th. I have been reading trip reports and the conditions look like they can be quite variable. I had a few questions if anyone has any experience for this time of year. I am worried about the snow and night time temperatures. First: As far as gear goes I have the whole spectrum from microspikes to snowshoes to cross country skis. I was thinking Kahtoola micospikes and gaiters would do the trick most years in early July. Am I off base? I go snowshoeing regularly but technical stuff is a different ballgame. I saw people mentioning ice axes and got a little nervous. Secondly: I am usually a hammock camper but I am worried about the weather. I use my hammock and a 20 degree outer quilt for casual backpacking and my tent and magma down 10 degree bag for winter camping. Would it be warm enough (and enough trees) to use my outer quilt and bag to hammock camp? I have done this in sheltered areas at below freezing temps but I feel like the wind could pick up pretty well on a bad day up there and make for a miserable night. FWIW: The 1st time I visited the Enchanments was over 4th of July weekend. 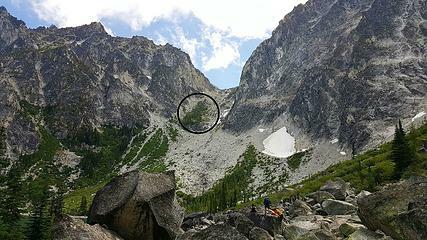 We went in via Colchuck / Asgard pass and camped at the pass (on bare ground). Weather was very fair that year and snowpack typical. We used used ice axes and full shank climbing boots up Asgard, but not crampons, though we carried crampons. Be sure to travel on climbers left and skiers right on Asgard and avoid the center -- Where multiple deaths have occurred due to breaking through snow bridges into the creek. Not a lot of hammock trees above Snow Lakes or Colchuck Lake -- unless you head over to Shield Lake -- which pretty far from the usual areas. Last time we applied for a pass we won in early June. We had been up many times in years past and had thru hiked a couple years. 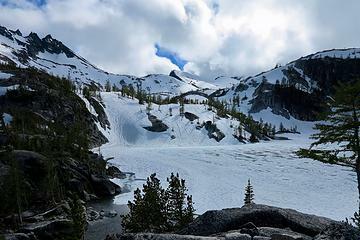 Colchuck Lake was frozen but open on the edges for night one. Next we headed up to the pass. We headed to the left but it was still slides we finally bailed at the trees about halfway up. The next weekend their was a fatality. Haven’t been back since. Of course 6 years ago but typical weather in mid July. I would hazard a guess that by July you will not need snowshoes. May be snow on the ground still but it should be consolidated enough to boot it. Microspikes/other traction might be useful, probably depends on time of day you find yourself on the steeper slopes. Thank you all for all of the great info. Sounds like I should be good with spikes and maybe an ice axe. Though, my plan for using a hammock is more ify. I have been scouring the forums about hammock camping in preparation. How does this sound as far as having trees for hanging a hammock that are robust enough to hold me without damaging the trees. 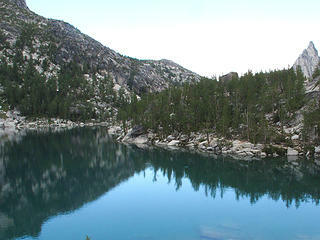 (some of the trees in the pictures look pretty fragile) We would plan to start at Stuart trailhead and out snow. From what I have read there should be enough trees at those camping locations. I think Inspiration might be challenging for a hammock. No problem at the others. I wouldn't want to be hammocking in the core zone--way too limitiing--but that's just me. 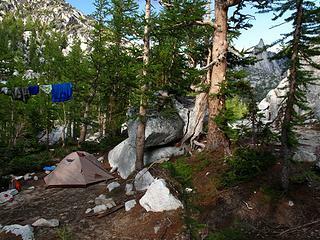 I've hammocked several times in the enchantments. Not limiting at all. Decent spots almost everywhere. Go for it. The snowpack is already melting fast, I would expect much of the Core to be bare ground by July. I am not a hammock camper, but it sure seems like there are tons of spots with reasonable sized trees spaced 10’ apart or so over bare ground in the Core. Yeah, at the top of Aassgard, it’s pretty barren, but below that there are lots of trees. Sounds good. Thanks for all of the help from everyone. I think two if us will try hammocks and one will go with a tent. Its also good to hear that its melting and we should have good weather by July. I am way too excited for a hike that is still months away. Its going to be a long three months of waiting. I will make sure to post a report to let everyone know how it goes! Weather and snow and such change from year to year of course, but here are some pics from June 25, 2016. This is a picture of Lake Vivienne taken on June 20, 2017. Everything above this lake was frozen solid. I used Petzl Lynx Crampons. The standard route (out of the picture to the left) was absolutely unusable. I walked down to the south edge of the lake, onto the frozen lake, and proceeded up the gully on the left side. Seemed to be the standard route for climbers proceeding to Prusik Peak. Fun trip, didn't see a ranger. Camping was, of course, on snow. Aasgard was frozen all the way to the bottom.